Google's Driverless Cars are using a Lightly Customized Ubuntu! Only last week we came to know that the upcoming Sony Play Station 4 (PS4) is based out of FreeBSD. And it is a fairly common knowledge that Google uses a modified version of Ubuntu at their workplaces. Now, it seems like Linux is being used at even more unheard of places. Google's driverless cars are a pretty familiar phenomenon in tech circles. But I don't think many are familiar with the fact that they are running a modified version of Ubuntu at its core! 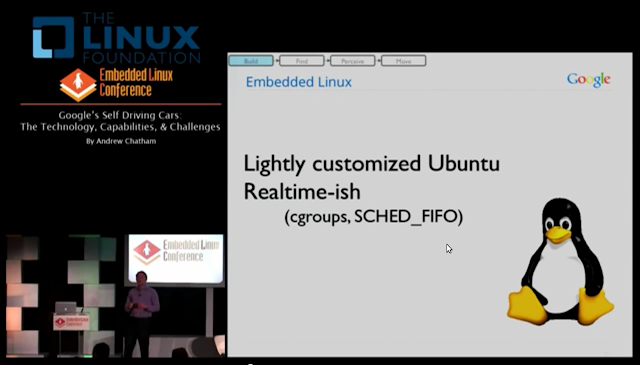 This lesser know fact was recently revealed by Andrew Chatham during his keynote speech at Embedded Linux Conference 2013 conducted by The Linux Foundation. Watch the entire video clip below. Trust me, it's worth your time. Credits to reddit.com for the video.